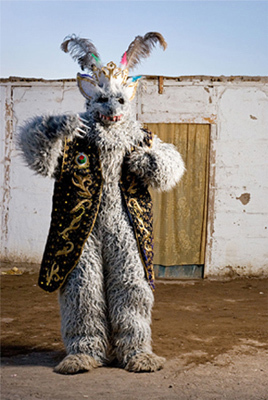 More than a one century ago, in the territory that corresponds to the Atacama Desert at the very North of Chile, several religious celebrations were born as a result of the fusion of indigenous cultures and the Catholic religion. Dancing groups organized in community societies and family groups gather every year to celebrate their faith, dancing to the rhythm of imposing brass and laquita bands, creating a magnificent audio-visual display. The dancers seek to communicate with the divine as an act of empowerment within a society fraught with social injustice. The project Bailarines del Desierto (Desert Dancers) initiated by Andrés Figueroa in 2008 aims to create a dignified image archive of this popular religious culture through photographic portraits of a living heritage.